This basket is folded from a single rectangle sheet of paper. I've called this an 'almost origami' basket, as it can't strictly be called origami, as I have used glue to hold the basket together firmly. The basic principle, however, of folding a sheet of paper to make a three dimensional object is the same as traditional origami. The proportions of the paper will determine the size of the basket and the length of the handles. I used half a sheet of letter sized paper cut lengthwise, which gave a sheet of paper that was 4.25" x 11". The longer the rectangle is in proportion to the width, the longer the handles will be (if this doesn't make sense, try making it - it will soon become clear!). Any paper will work well, however it is best not to use heavy or thick paper as this will be difficult to shape. This isn't a difficult project, but it is definitely a good idea to make the basket from scrap paper to start with. This is particularly important if you want to place a rubber stamp in a specific position on the basket. The best way to do this is to make the basket out of scrap paper, draw on the basket where you want the rubber stamped image to appear, carefully undo the basket and use this as a template to position the rubber stamped image on the quality paper. 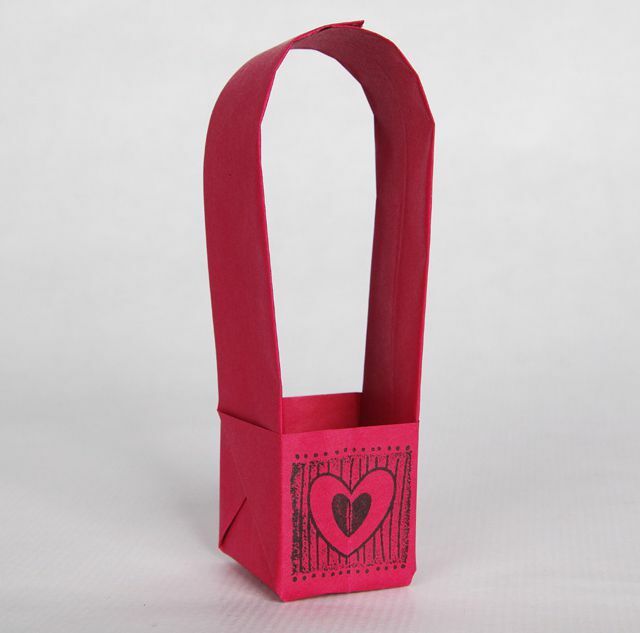 See the following pages for a step by step guide to making this easy origami-like folded paper basket. For a wide selection of other gift packaging templates and projects, including both gift bags and gift boxes that are perfect for customizing to any occasion see - Gift Packaging Projects. Start with a rectangle of paper. If you are going to stamp the paper it is best to do so before you start to fold the paper as this will make it difficult to obtain a clear stamped impression. If you have a paper scorer, score and fold the paper as you go to get crisp edges. With the folded edge of the paper at the top, fold the paper in half again from left to right. Carefully pull open the outside edge of the paper and fold the top down on each side so it forms a triangle. Repeat this on the other side. With the paper folded so that one triangle is exposed, take one edge of the paper and fold it so that the triangle is folded back on itself (fold A to B in the image) and repeat on the other side. The triangle shape will be the bottom of the basket. Lightly mark the top of the paper to indicate equal thirds. Fold one edge over at the first mark and fold the remaining edge over on the second mark (fold A to B and C to D in the image). Repeat this on the other side. Now is the clever part! Carefully pull the two long pieces apart and use your fingers to flatten out the triangle to form the base of the basket. At this point I carefully run a row of glue along the edges of the handles to hold the edges firmly in place. If this is just a run through and you are going to unfold the basket then don't worry about adding glue. The basket can be finished by gluing the handles together. If you want a shorter handle trim the excess as required. There are a number of ways that this basic basket can be adapted, see the following page for a simple yet effective variation. Instead of forming the long edges to make a handle for the basket, an interesting variation is to roll the edges over to form scrolls.